A man’s daughter had asked the local minister to come and pray with her father. When the minister arrived, he found the man lying in bed with his head propped up on two pillows. 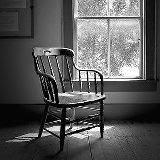 An empty chair sat beside his bed. The minister assumed that the old man had been informed of his impending visit. “I guess you were expecting me,” he said. The minister was deeply moved by the story and encouraged the old man to continue on the journey. Then he prayed with him and returned to the church building. Two nights later the daughter called to tell the minister that her daddy had died that afternoon. “Did he die in peace?” he asked.